We are delighted to offer the fantastic Castmaster Xl Chiminea Cover 122cm X 56cm. With so many available right now, it is great to have a name you can trust. The Castmaster Xl Chiminea Cover 122cm X 56cm is certainly that and will be a great buy. For this price, the Castmaster Xl Chiminea Cover 122cm X 56cm is widely respected and is a regular choice for lots of people. Castmaster have included some great touches and this means great value. Our Deluxe Xtra Large cover is suitable for our chiminea's from 50-55" tall, these being the Sienna. The Classic Urn, the Vineyard, Soleil and the 53" Basket weave chimnea. 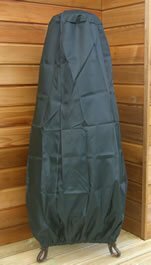 Hardwearing, 100% waterproof woven polyester fitted chiminea cover with elasticated fastening for simple securing. UV stabilized. This item is supplied in a green colour material.